Suzanne Neville Lace 'Antonia' Wedding Dress and Jenny Packham Bridal Accessories for a traditional wedding ceremony in Peterborough Cathedral and a reception at Stapleford Park. 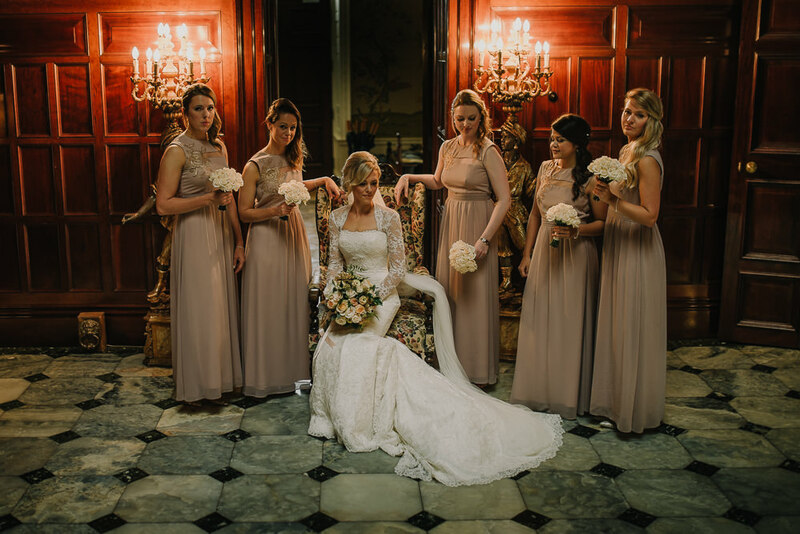 Bridesmaids wear pale pink dresses and Groomsmen in tails. 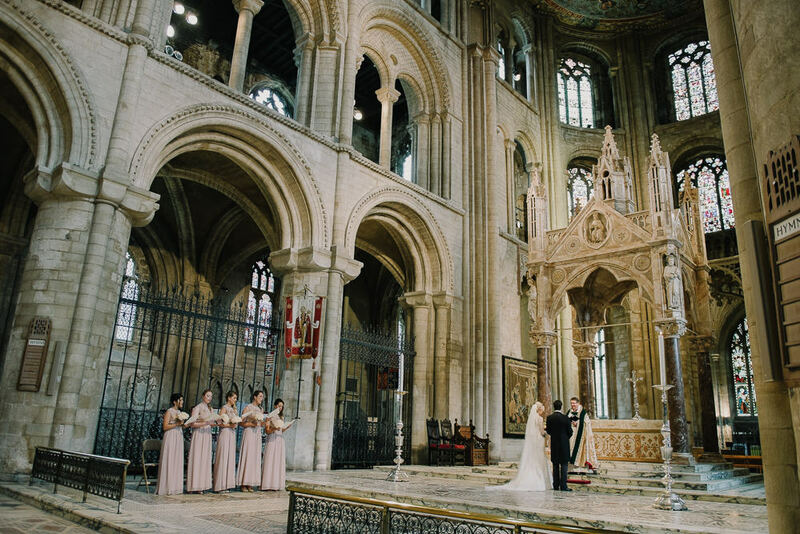 The beautiful Katie and equally handsome Ben married in Peterborough Cathedral; where they both have strong childhood memories and spent many an afternoon singing there. 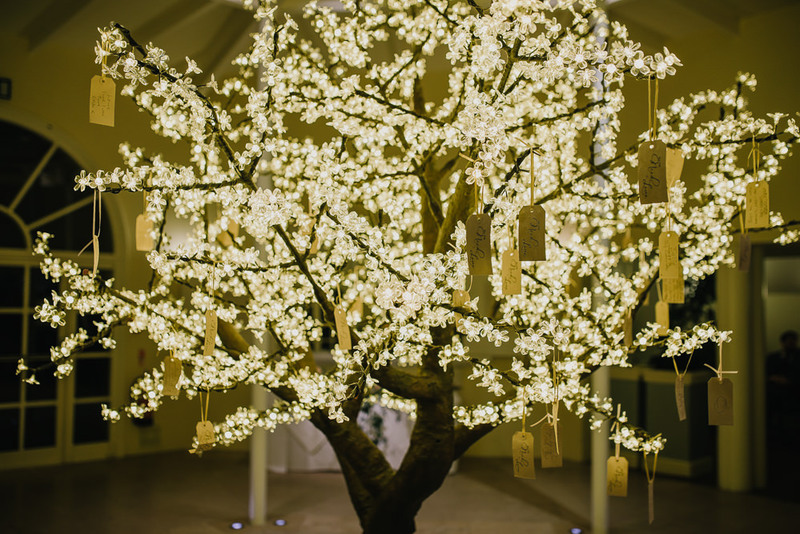 After that they headed to Stapleford Park for their beautifully elegant reception, where guests were greeted with a monumental light up tree in the entrance hallway and encouraged to hang notes on for the bride & groom. 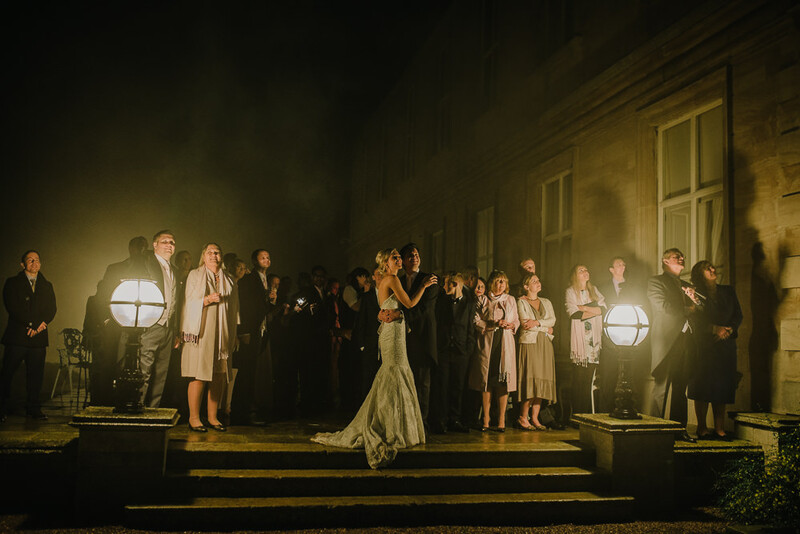 All the autumnal mist in the picture’s, added an air of romance to their traditional English wedding and kind of makes you feel a bit like a you’re in a Richard Curtis movie! Katie looks like the perfect leading lady in her Suzanne Neville ‘Antonia’ lace gown. So if you enjoy enchanting love stories and all thing pretty you’re going to LOVE this! 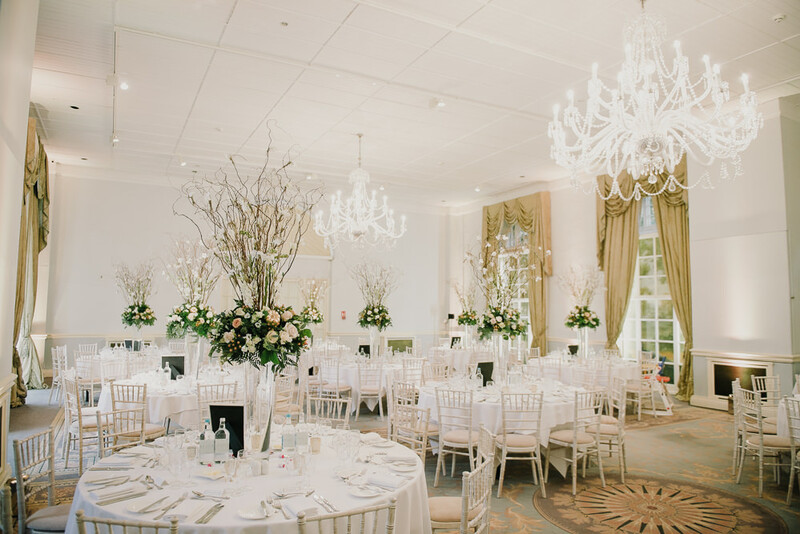 Katie The Bride: I’ve lived and grown up in the Stamford area and since the Bridal Rooms opened in 2011 I have stared longingly through their gorgeous windows! It was my first port of call – and the owner Aimee was an absolute star from the word go. She pulled a cross-section of gowns for me to try (as I really didn’t know where to start) and ‘Antonia’ was the very first dress I tried on…! I did play devil’s advocate and try a few more on (both there and in London) but my heart was stolen by dress #1! Aimee and Rachel at the Bridal Rooms helped put my whole look together, including the Jenny Packham “Acacia” head piece and belt, stunning HM Veils veil and Rachael Simpson shoes. I had a bit of a last minute panic that I was going to be freezing on the day (as our wedding was mid-November) so had some bespoke sleeves added to the dress, which I absolutely adored. 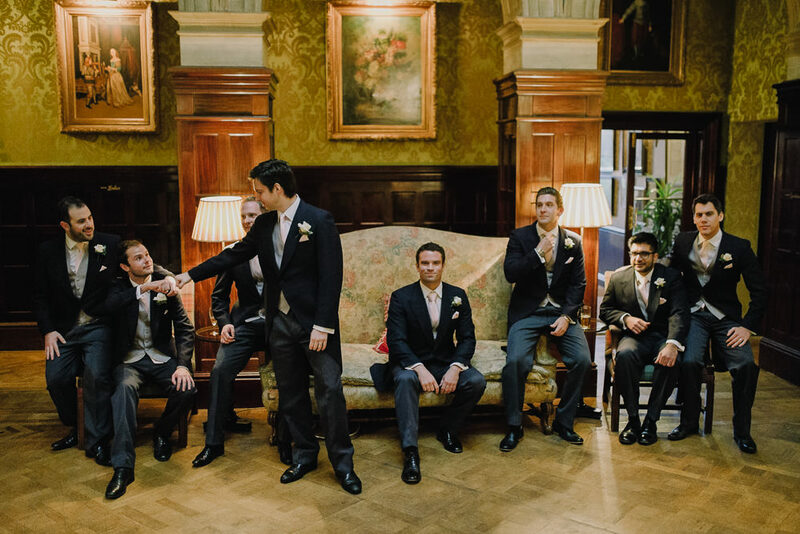 The navy tailcoats, waistcoats and ties were all hired from a reputable local shop in Stamford, Lincs (Bride & Groom’s hometown); Colin Bell Menswear. Ben and I met when we were 11 years old at the King’s School Peterborough back in 1997. Kings is the Cathedral School of Peterborough, so Ben and I spent many an afternoon at services singing ‘Jerusalem’ together in this beautiful building! I was also a chorister there for 4 years so the Cathedral means an incredible amount to us – as it was such a big part of our childhoods. It was so moving to be back in the same building getting married – surrounded by family and a lot of our school friends, who we’ve remained close to. I stumbled across Stapleford Park a few years back when on a spa day with a close friend. Ben and I weren’t engaged at the time but I snuck the wedding brochure home after our visit (keeping it well concealed, obviously!) After Ben proposed on Christmas Eve 2013 I suggested we could perhaps just drive over and have a little look at this place I’d heard about… luckily Ben loved it as much as I did! 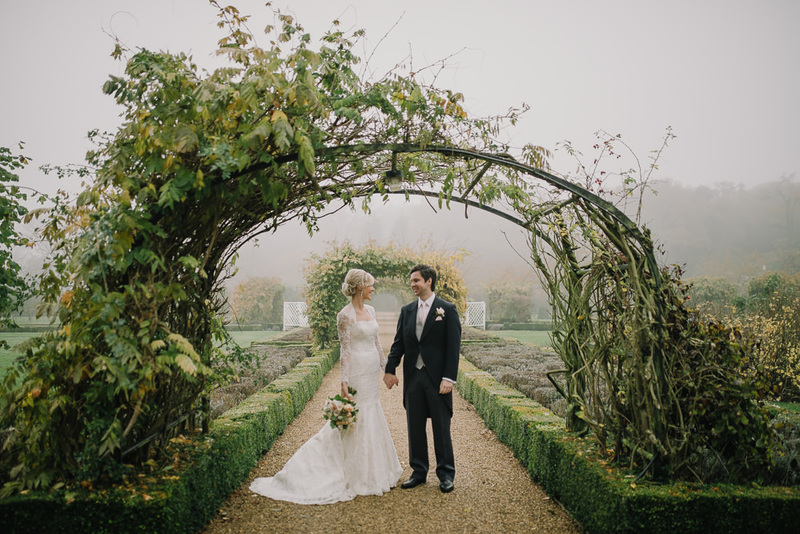 We had a beautifully misty wedding day which made Stapleford Park and its surroundings look extra magical! The staff were incredible and did everything they could to make sure our day ran smoothly. Most of our guests stayed at the hotel (in a selection of beautiful individually-designed rooms) which just added to the party feeling! My bridesmaids and I also stayed at Stapleford the night before in the Pavilion Cottage – which is where we got ready on the morning of the wedding. The colour scheme was a lot of gold! Stapleford has gold running through its interior (particularly in the Grand Hall) and I felt that it was the perfect winter-wedding hue! 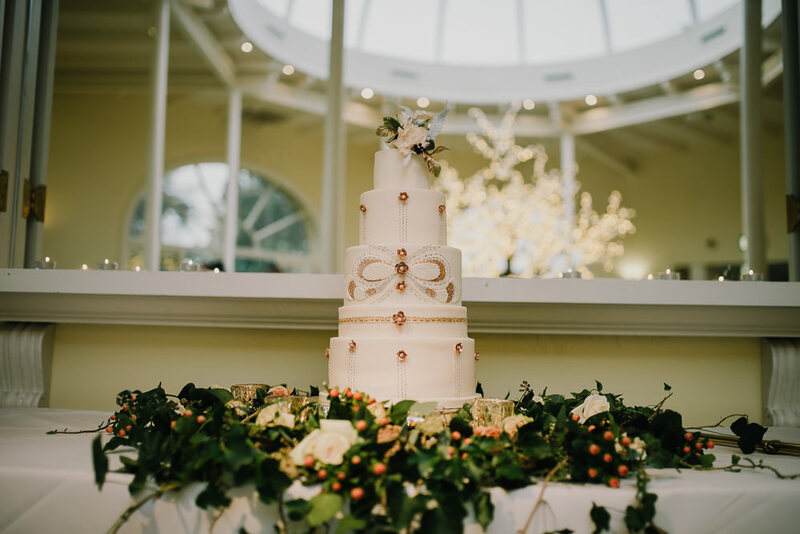 Gold was complemented with different soft tones of dusky/rustic pinks (reflected in the bridesmaid’s dresses, cake, flowers and reception venue décor). We decided not to do any flowers in the Cathedral at all as were worried that they could potentially get a little bit lost! My bouquet was a classic hand tied style with a golden satin ribbon (and gilded succulent!) and it was absolutely stunning. In the table centrepieces Rebecca used lots of ivory flowers, roses and dendrobium orchids alongside tuberose and light caramel peach roses such as ‘quicksand’ and ‘caramel antike’. Rebecca was amazing – not only is she incredibly talented but she made all our beautiful bouquets less than one week after having a baby! Amazing woman! I wimped out a bit with bridesmaid dress shopping! Instead I browsed the internet – and came across these dusky pink maxi dresses on Little Mistress London’s website. They also had an embellished gold flower at the top and were absolutely perfect for our colour scheme. I sent a cheeky snap to all the bridesmaids and luckily they loved it and all looked stunning on the day. The flower girl was my gorgeous niece Eliza. She had a little ivory, silk dress from Next and had a mini version of the Bridesmaid’s bouquets. A particularly emotional moment was being walked down the aisle by my father, as Ave Maria was sung by an old friend and ex-chorister, Hannah Sandison. It was truly beautiful. We then had a fireworks display at 10pm courtesy of Komodo Fireworks – the display was in our wedding colours (a lot of gold and pink) and blew us away…!!! It was bigger and better than we could have possibly imagined and was the perfect way to start the party in the evening. Our photographer was the amazing David Wickham of Modern Vintage Weddings. Rebecca Moody (Pollen Designs) recommended him and the minute I laid eyes on his portfolio I was in LOVE. We had an hour-long skype meeting with him to get to know each other and describe what we were after – which confirmed that he was definitely the man for us! We also had a face-to-face meeting with David nearer to the big day and booked a pre wedding photo session, which helped put us at ease when being photographed and I would definitely recommend it to others. On the day, David was an incredibly calming, amusing and reassuring presence. He helped bring out the best in everyone and his ability to capture all the split-second, sentimental moments was incredible. He was also very helpful to have around – without being pushy he managed to round people up and get all the ‘portrait’ pictures done within a matter of minutes! We were overwhelmed when the photos of our wedding came through – we love them so much. David captured our day perfectly and we will treasure the images (and re-live the moments) forever. This is so Beautiful, what amazing photo’s, such a Grand Venue to tie the knot.